Vehicle logistics operators have a unique set of challenges. They often have to deliver to urban locations that may have time restrictions, access issues, preferred routing and restricted routing. Having real time end-to-end visibility of assets from point of collection through to delivery, coupled with electronic proof of delivery (ePod), enables vehicle logistics operators to make the most effective use of their resources & assets. The CALIDUS TMS suite allows your business to cope with ever more demanding SLAs whilst allowing you to be efficiently plan and profitability execute your operations. Fleet utilisation is a large challenge for transport managers, with under-utilisation of fleets, wasted floor space and empty journey legs being a common occurrence. Our transport management software enables you to easily plan regular routes, schedule preferred delivery slots and even adapt routes in real-time to traffic issues and your customer’s constantly changing delivery requirements. Back-hauling, cross-docking and posting unallocated loads onto sub-contracting portals is also possible if required. Driver compliance is another key concern for transport managers. Not only is compliance a legal concern– it can also improve fuel efficiency by as much as 33%. Telematics software is no longer just restricted to route planning - it can now assist with driving behaviour. Drivers are provided with real time alerts to improve their behaviour in real-time, with feedback on speeding, steering harshly, sudden braking, over revving, actual fuel consumption and fuel efficiency, as well as wasted fuel due to idling. Transport managers can then access a traffic light system of reporting dependent on severity, which can be used towards future training plans. Vehicle checks can present a challenge to drivers due to time constraints and lack of knowledge on what to look for. Our transport management software can guide drivers through the process with a mobile pre-defined safety checklist which features photo capture capabilities, freeing up time and preventing lost paperwork and proof of compliance. 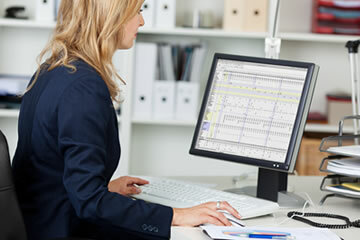 Our software can also assist with adherence to the maximum working and driving hour rules and regulations. By combining telematics with route optimisation, you can plan appropriate break points in a way that best utilises your fleet, track whether drivers are adhering to these and provide detailed reports to show compliance. CALIDUS TTM (Track and Trace) provides transport teams with the means to track their fleet, from departure all the way to delivery – improving operations and customer service. TTM integrates with telematics and electronic signature capture (ePod) so that you can access live ETAs, delivery arrival and departure time, delivery confirmation and signature capture. If required, this can integrate with customer software or portals, providing visibility to your customers and removing requests for updates. It also helps you to avoid any penalties for missed delivery slots. Transport managers need to be able to quickly and accurately assess the profit levels of their operations. That is why our transport management software has a Red Green Amber dashboard so that you can quickly identify profitability by levels determined by you. You can also analyse your operations even further and establish which customer, contract, vehicle or assignment generates the biggest margins. Once delivery is completed, inbuilt billing functions reduce lengthy calculations for complex operations and tariffs and integrates with the ePOD system so there is no waiting for paperwork before invoicing. The result: reduced service to billing time and administration costs, as well as eliminating lost paperwork.